The Official Website - The Mathematics Survival Kit 2nd Edition taught at the University of Guelph from 1974 to 1976. He spent the next five years at Parkside High School in Dundas, Ontario. In 1982, he was re-recruited by Guelph and has been happily teaching and writing there ever since. He has won both the University of Guelph Professorial Teaching Award and the prestigious Ontario Conderation of University Faculty Associations Teaching Award. He has been listed as a "Popular Professor" in MacLeans annual Canada wide University survey eight years out of nine! In 2007, he was the University of Guelph Central Student Association Teacher of the Year as well as the winner of an Ontario Government Leadership in Faculty Teaching Award. It's 2 a.m. and you are stuck. You have forgotten how to "complete the square", which you need to complete a calculus question or an algebra question or a statistics question or ... Your text gives lots of examples but none of them review the completing the square technique. 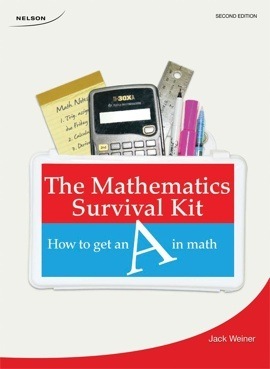 Here comes The Mathematics Survival Kit (2nd Ed.) to the rescue! Find the page you need in the Survival Kit. A quick 5 to 10 minute concise and friendly review gives you exactly what you need to continue with your homework. Get an "A" in Math! 115 key topics typically covered in any first year university calculus and algebra curriculum. Provides a concise and friendly review that gives students exactly what they need to continue to complete their homework. Each topic is covered in one page. Almost all consist of an introductory sentence or two, a first, very straightforward example, a second example illustrating a common variation, plus 2 extra questions with answers to reinforce the techniques.